This chapter provides information about the clutch and the automatic transmission to enable you to understand the operation of these units, to diagnose problems, and to prescribe corrective action. To obtain more detailed information on the operation and repair of specific units, refer to the specific manufacturer's maintenance and repair manual. To make practical use of engine power, a coupling device, or clutch, is needed to connect and disconnect the engine from the drive line, as necessary. The clutch or torque converter provides for complete separation of power or at least slippage at an idle. The automatic transmission, like manual transmissions, matches load requirements of the vehicle to the power and speed of the engine. It is important to briefly review the purpose of the clutch and also the various types of clutches. 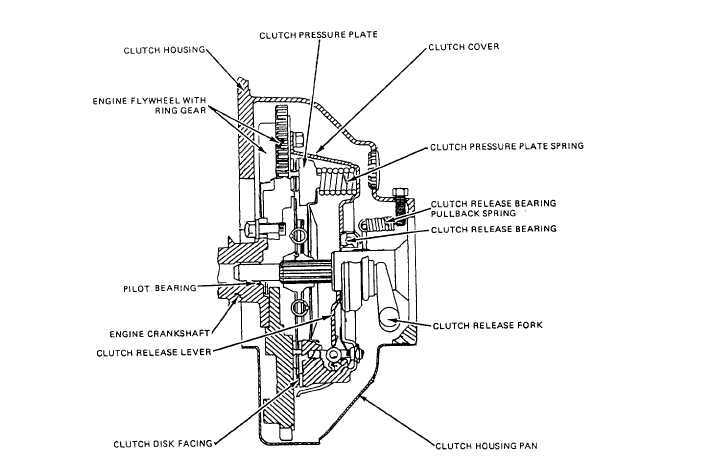 The clutch permits the operator to couple and uncouple the engine and transmission. When the clutch is in the coupling (or normal running) position, power flows through it from the engine to the transmission. If the transmission is in gear, power flows through to the vehicle wheels, so the vehicle moves. Essentially, the clutch enables the operator to uncouple the engine temporarily, so the gears can be shifted from one forward gear position to another or into reverse or neutral. The flow of power must be interrupted before the gears are shifted; otherwise, gear shifting is extremely difficult if not impossible. The clutch assembly (fig. 7-1) contains a friction disk (fig. 7-2), or driven plate about a foot in diameter. Figure 7-1. - Typical clutch assembly.